Let’s put our personal feelings aside for a second and let’s reason together. Kevin Durant has risen his game to the point where his place in the basketball hierarchy is no longer deniable. His scoring has always been his strongest attribute and he has even become more deadly in that aspect of his game. Now he has become an elite defender, his playmaking has improved and he has developed that mean streak that all the great ones possess. Before, KD was just a phenomenal player and got the best of you by mistake. Now he’s intentionally better than you and wants you to know about it. I know his decision to play for the Golden State Warriors is looked upon as a stain on his basketball rap sheet to many but in my eyes, it is the very thing that has allowed him to become the force he is today. I personally think Durant has been the best player in the league since 2014. But over the last two years he has turned into something else and the move to Golden State and its residual effects allowed him to unleash the full range of his power. Think of it as him going from Jean Grey to the Dark Phoenix. What are these side effects you might ask? One of the main components that is present anytime someone elevates themselves to the height of their potential is adversity. I know, he joined a 73 win team so winning should be easy right? Wrong. Think about what led him there. The Oklahoma City Thunder were up 3-1 in the 2016 Western Conference Finals and failed to get the job done. Then that same summer, he joined the very team he lost to in dramatic fashion for a chance to compete for a NBA Championship. The adversity wasn’t necessarily on the court (it was but that comes later) but in that very moment he became the one thing he had never been in his basketball career before then: unliked. KD had always been pretty well received by the public before then. Once he made his announcement via The Player’s Tribune, he experienced vitriol and hate that he had never experienced as a professional. But honestly, that was the best thing to ever happen to him. It changed him mentally. In terms of skill and talent, KD had always been one of the best in the league. When he flipped that switch mentally from wanting to be a nice guy to wanting to destroy people nobody stood a chance. The naysayers had inadvertently given him a new purpose and drive. They gave him the desire to prove people wrong. He developed an attitude problem. A guy who once requested that he be called “The Servant” turned into a snarling beast on the court and in the media. Any submissive and docile attributes that remained within him were wiped away and all that was left was a rage and fire that would consume anyone standing in his way. He even said himself that when he was in OKC, he tried to please everyone. But he made sure to note that the person we are seeing now is the real Kevin Durant. He is outspoken and sometimes even a bit confrontational with the media. That brazenness has manifested itself on the basketball court as well. This was evident in last year’s Western Conference Finals. The Warriors seemed out of sync and the Rockets had them out of their normal rhythm. The fluidity and precision they normally play with was interrupted and the game got very laboring for them. Durant took matters into his own hands and dominated the game on both ends to lead his team to a victory and a Finals berth. I’m not sure OKC Kevin Durant would have been willing to do that. He would not have had the nerve to be that selfish even out of necessity. Thank the internet trolls for that. Now that we’ve got that out of the way, let’s get down to the heart of the matter. 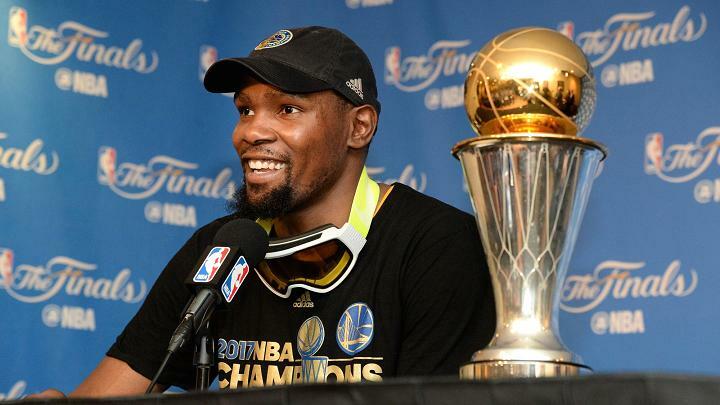 No one playing today can compare their game to Durant’s. He has the most versatile offensive skill set on planet Earth and defensively he is a menace. He gets any shot he wants, when he wants and against any defender. He can score with precision and efficiency at all three levels and his 3 pt range extends farther than most. His handle allows him to get anywhere on the floor he wants and he can shoot off any dribble move. He has incredible balance and footwork as well. As if all that wasn’t hard enough to deal with, go ahead and throw in the fact that he’s a legit 7’0″. You really only need one word to sum up Kevin Durant offensively and that word is unstoppable. Here’s the area that Durant has shown the most growth and what I think mixed with his offensive superiority elevates him above everyone else, his defense. KD has become a tremendous defender. He takes it personal on that end now. It’s really what separates players at the highest level. When you think of Michael Jordan and Kobe Bryant, what gets lost a lot of times is their intensity and bulldog-ish nature on the defensive end of the floor. KD has adopted that mentality. He challenges himself. He assumes the responsibility of guarding the other team’s best player. But just wanting to do it is one thing, he actually does a great job at it. He sits down. slides his feet, uses his length to be disruptive and makes life exceedingly difficult for anyone he guards. That doesn’t happen by accident. It takes a special type of player to dig in and say that they are going to make their presence felt on both sides of the ball. A lot fo people can put the ball in the basket. You have to have a desire to be a monster on defense. Durant has proven that he has it. What’s most impressive about this is KD knows he will never get his just recognition for what he brings to the table on that end of the floor. He is fully aware of the position he’s in. He is not playing for personal glory and accolades. He is playing to be the best player in the game and to be a winner. People are acting like he went to The Warriors and rode their coattails to success. That is as far from the truth as Mercury is from Pluto. You can slice it any way you want but the fact remains that KD has separated himself from the pack. No silly narrative, insult, clever meme, joke or hateful tweet can change that. It’s just to just face facts and go forward in peace. Flip the page to see him proving he’s just better than everyone else.